Clinical Documentation should be Quick and Easy. It Should NOT Be an Ordeal. Conclusion.. and Taking it One Step Further..
As physical therapists, our number one priority is patient care. After all, we want to treat patients as best as we can, and get them better as quickly as we can. If we had a choice, all of our time and energy would be spent on treatment, and little or no time would be spent writing notes. After all, who likes writing notes? However, we have to document. We can’t avoid it. Documentation proves that treatment was provided, was medically necessary, was compliant, and is a pre-requisite to reimbursement. The truth is, we have to document. We can’t avoid it. Documentation proves that treatment was provided and was medically necessary. It is a pre-requisite to reimbursement. The burden of proof – proving that the treatment was justified and medically necessary – falls squarely on the shoulders of the clinician, and we have put together this resource and checklist on how to speed up your documentation. In order to provide excellent care (and to get reimbused by payers), and you have to do everything to make sure that your documentation is done quickly (speed) and correctly (compliance). You may have the best marketing person in the world. You may have a full patient schedule. However, if documentation isn’t getting done on time, the claim won’t go out. If the claims don’t go out, the payments won’t come in. That’s why it’s important to complete documentation as quickly as possible. The problem is that the majority of physical therapy software systems force the therapist to become data entry machines, basically glorified typists. They force the physical therapist to do lots of clinical documentation, forcing you to accept that this is ‘compliant’. That’s why some physical therapy software systems can actually make the clinician slower. The truth is: Clinical documentation should be quick. It should not be an ordeal. Physical therapy software should empower clinicians to complete compliant documentation quickly. When combined with the right physical therapy documentation templates and the correct use of physical therapy CPT codes, the clinician can finally do what they do best – treat patients. Ever felt like this while documenting? Freedom from the burden of endless documentation opens up new possibilities. A clinician can now spend more time on important areas like improved patient treatment, boosting staff productivity and efficiency. Let’s face it…no one likes spending endless hours doing documentation; we all would much rather be using that time doing other things – perhaps spending time with family. So the question is: how do you complete documentation quickly and effectively? 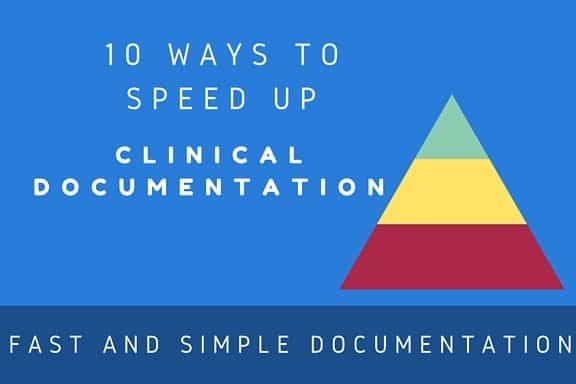 Here are 10 ways to complete clinical documentation quickly. Before you wrap up for the day and head home, your objective should be to finish all of your documents. You cannot have documentation piling up. When patient documentation starts to pile up, it can become extremely frustrating, creating pressure on the clinician who has fallen behind. This creates a culture of inefficiency within the clinic and cripples cashflow for the clinic. It is vital to establish a plan for yourself and other therapists within your clinic to facilitate the consistent completion of clinical documentation on a daily basis. When you are working with a patient, you have to document on-the-fly. Work with the patient and then take a moment to document as you are interacting with the patients. You must be able to treat and document simultaneously. The problem arises when a therapist spends 30 minutes or more with a patient without documenting anything. They then try to cram in as many notes in as possible in the short interval between one patient’s treatment session ending and the start of the next patient session. This type of workflow will create an ever-escalating mountain of documentation. The therapist will inevitably struggle, working weekends and off-hours to try and catch up. The clinician will experience a downward spiral into this “documentation black hole”. In severe cases, it makes clinicians question the validity of their choice of an occupation that demands they cut themselves off from family and friends in order to sit joylessly for hours in front of a screen entering data. In Touch EMR has pioneered ‘auto-text technology’. We call this ‘the creation of customized short codes’. With this technology, a therapist types out a few letters and the system automatically populates the rest of the phrase. Auto-text technology can allow a therapist to populate several phrases by simply typing in a ‘short code’. This feature will allow the clinician to save a substantial amount of time. For example, the therapist types in ‘stg’ (a shortcode) and the system automatically populates entire phrase “The short term goal for the patient is the ability of the patient to climb up two flights of stairs without pain and discomfort”. When your tablet, mobile device or computer supports voice recognition, your EMR system should be able to automatically recognize your voice and translate it into text. While voice recognition has its advantages for documentation, it has some practical limitations. When you are working with a patient, you may not always want to openly narrate the patient’s circumstances. This is especially true if there is even the slightest chance that you may be overheard by someone nearby. This could be a HIPAA violation so you want to be careful while using voice recognition. Let’s say a clinician creates a daily note, and this is daily note number 3. The physical therapy software system should automatically ‘carry forward’ data from the previous note, daily note 2. What this means is that “daily note 2” will be a copy of “daily note 1”. Also, “daily note 3” will be a copy of “daily note 2” and so forth. All of your data is re-populated when you are documenting. As a clinician, you are responsible for changing / updating clinical status to demonstrate progress. You are documenting a change or improvement in the patient’s condition. You should also be able to ‘override’ this setting and choose any previous document as the basis for carry forward. It’s a tedious process that is repeated over and over again. Software should include auto-scroll technology. It should allow the user to click one button and get redirected to the top of the page. An auto-section redirect capability is another way to minimize clicks and scrolls. For example, clicking one button will allow the user to automatically save all data under Subjective and Objective and then re-direct the user to another section. Sometimes, we tend to over document out of fear – the fear of a claim denial due to insufficient physical therapy documentation. If you use your clinical judgment every single time, the quality of your notes will improve dramatically. When you use your clinical skills to document, you can reasonably expect to be paid for a claim. The jury is still out on outcome measures. Outcome measures do not make or break your documentation. A clear and precise description of clinical judgment is more important than robotic, data driven outcome measures in your documentation. The bottom line: use your clinical judgment and expertise to document as much as necessary. Documenting more does not make you more compliant. It makes you slow and inefficient. Your flowsheet is supposed to not only document what you did with the patient (how many reps, sets, etc. ), but it should also reflect what you are billing out. In addition, it should also contain treatment precautions and supporting documentation. The ‘old school’ flowsheet is a list of exercises with reps and sets. To be compliant, and to survive audits, your flowsheet should resemble a billing log and a treatment justification log. Auditors will not be able to deny your claims when you are able to demonstrate what you did, why you did it and how you billed it out. In Touch EMR includes flowsheet templates that allow the therapist to populate entire treatment charts with one click and edit them to select the things you did or did not do.Schedule a demo if you want to see some of the In Touch EMR flowsheet capabilities. Your EMR should automatically alert you when it’s time to report functional limitation G codes and when it’s time to report PQRS. This is critical if you see a lot of Medicare patients. Choose EMR vendors that are listed as PQRS registries with CMS. All PQRS logic should be coded into the software, and trigger automatically. The system should automatically alert the user to select the most appropriate PQRS or FLG codes depending on the encounter. Let’s face it. Some clinicians document faster than others. It’s important to identify clinicians who are lagging behind with documentation and help them improve speed of documentation. Software should help analyze the note-taking speed of different clinicians by comparing their documentation output. It should display the number of clinical hours, notes completed and revenue generated. This will allow management to determine EXACTLY which clinicians need to improve documentation time. If you are doing everything described in this article, you should be able to complete all of your documentation before the end of each day. Efficient documentation results in increased productivity, increased employee satisfaction and improved cash-flow. All these tips and strategies should improve your systems, and software should make things much easier. For example, your physical therapy EMR software should automatically transmit a claim to the billing software. In an ideal world, documentation and billing should be complete before the patient has left the premises. Imagine what this will do to your cash flow. This will change your practice forever.